If a Virginia championship wins you an NCAA Tournament bracket pool, you can guarantee yourself a payout by hedging your bet with a play on Texas Tech in Monday's title game. If you're one of the lucky (smart? no, [I'll stick with lucky](https://www.youtube.com/watch?v=UHVOFjx4Tfc)) few who will win your NCAA Tournament bracket if Virginia wins Monday night's championship game, you can guarantee yourself a payout by hedging your bet with Texas Tech in the title game (8:20 p.m., CBS). __MORE:__ [Our complete national championship game coverage](https://www.betchicago.com/ncaa-basketball-betting/home) ## National championship game hedge bet Let's say you plunked $20 down in your office pool and you're set to win $500 if Virginia wins the national title. Each pool's payout is different, but we'll use $500 as our baseline. A $250 Texas Tech wager on the moneyline would net you $250 (they are even money at most Vegas sportsbooks). With your $20 entry fee gone, you'd still pocket $230. Your profit on a Virginia win would also be down to $230, but you've eliminated any risk. The same principle applies if a Texas Tech win results in winning your pool, but [less than 1 percent](http://fantasy.espn.com/tournament-challenge-bracket/2019men/whopickedwhom) of ESPN brackets had the Red Raiders winning it all, so we'll assume this isn't the case for many people. If you shop around, you can find Texas Tech +1.5, and it's probably smarter to take the Red Raiders on a spread bet. If you do that for $250 and it hits, you win $227.25 (-110) -- and you'll net $207.25 (winning bet minus bracket entry fee) and $250 with a Virginia win. This strategy also opens a tiny 1-point window where you can win both ways -- if the Cavs win by exactly 1 point, you win your pool for $500, plus the $227.25 on Texas Tech +1.5. That's the ideal scenario, although chances are slim you'll hit that middle. If you have Virginia to win your bracket but think Texas Tech is a team of destiny, your position in the pool allows you to change your strategy at minimal risk. Perhaps you bet $440 to win $400 on Tech +1.5. If the Raiders win, or at least cover, you profit $380. If UVA prevails, you still take home $60. You could also stand pat and hope Virginia wins. After all, it's only $20. 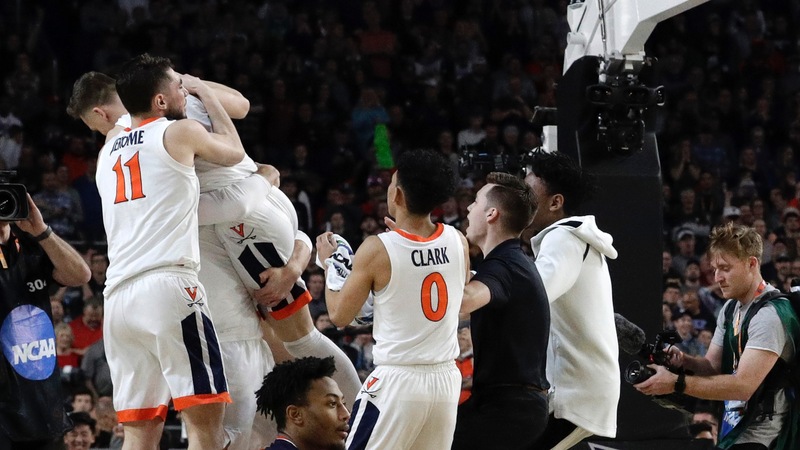 There's also a possibility you already won your pool if you had Virginia making the title game, since more than 60 percent of ESPN brackets had either Duke (36.1), North Carolina (15.8) or Gonzaga (8.9) -- none of whom made the Final Four -- winning it all. If you're in this position, you could always reinvest some or all of your winnings. __PLAY:__ Our [free daily contests](https://betchicago.chalkline.com) for the chance to win a BetChicago prize pack.